Last week, for the first time since its completion, Ir Amim field researchers observed traffic on the Palestinian side of the northernmost section of the Eastern Ring Road (east of Anata on map). Also known as the “Apartheid Road” – a reference to the separation barrier in the middle of the road designed to separate Israeli traffic from Palestinian vehicles – the strategic thoroughfare has been long built but never operationalized. According to Israeli media reports, the Israeli side of the road will be opened on January 10. The brainchild of former Prime Minister Ariel Sharon, the northern branch of the Eastern Ring Road was designed to solve the dilemma of E-1 splitting the West Bank into northern and southern enclaves by using road infrastructure to preserve a semblance of contiguity between Ramallah and Bethlehem. The road would allow Palestinians to navigate between the two centers of the West Bank while diverting them from both the E-1 area and Jerusalem. Currently, Palestinians use a road running through the area designated for E-1 to get between the two cities; the new road thus eliminates one of the obstacles to settlement construction in E-1 and should signal cause for heightened vigilance. At the same time as routing Palestinian traffic away from Jerusalem and E-1, the new road will afford two key benefits for Israelis: 1) expediting traffic flow to Jerusalem for settlers from the Ramallah area and 2) enabling expansion of the settlement bloc around Ramallah. The newly operational Eastern Ring Road is a key piece of infrastructure being used to implement the “Greater Jerusalem” policy: the de facto annexation of the three settlement blocs adjacent to the city – Gush Etzion to the South, Ma’ale Adumim/E-1 to the east and Givat Ze’ev to the north. It will be linked to Road 1, the major artery between Jerusalem and the Ma’ale Adumim/E-1 bloc, via another newly launched project: the Zeitim interchange (located close to the Az Zayim checkpoint). In other parts of the city, plans being developed to fortify the connection between the settlement blocs and Jerusalem include a tunnel to replace the French Hill Junction on the road between Ma’ale Adumim and the Begin Highway and expansion of the Tunnel Road between Jerusalem and the Gush Etzion settlements near Bethlehem. 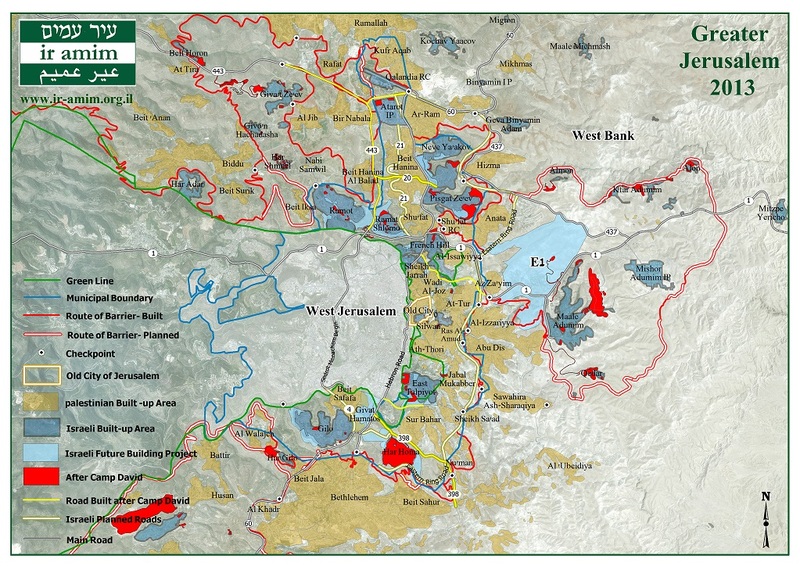 While legislative initiatives like the Greater Jerusalem (or Daughter Sub-municipalities) Bill and other plans designed to redraw the boundaries of the city may be stalled, infrastructure projects have already proven an effective tool for increasing connectivity between the blocs and the city, not only by solidifying physical linkages but also by eroding the boundaries of the city in the Israeli public consciousness. Ir Amim will continue to report on this story, with updated maps, in the coming days.